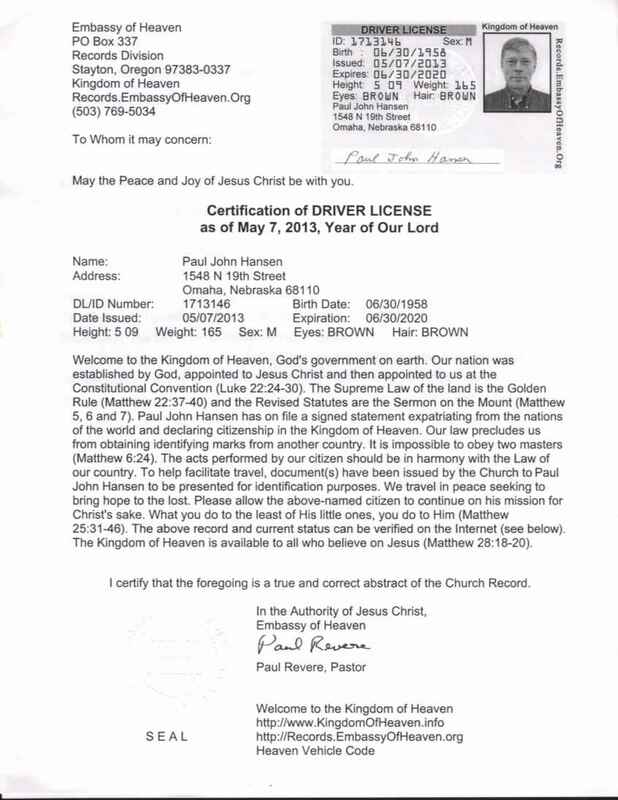 The US courts demand that I show proof of permission to pass on the highways. Here it is my friends have used them for twenty years successfully. Believe it or not the courts recognize church jurisdiction. by selecting “Verify – Driver License”. and enter my number 1713146.
to which the Kingdom License has, they said it was acceptable. Also the Omaha Public Library also accepted my Kingdom document to get a library card. Sue the people in common law, not the corporation. A jury will likely agree with you. I would not use a zip code as it denotes a U.S. residency. If you stated Non-domestic or Without the United States it would be better, but, I doubt the bank would accept it or the library would accept it, they need U.S. i.d.ed residences only. Of course maybe I’m wrong on that, but that is my current position and I’ve seen proof of it, A unlawful detainer/ejectment claim I put into the court was defeated by an BAR card atty who claimed I stated I was “without the United States” and did not claim a zip code associated with my Propertys address (which they claimed would have I.D.ed it as being “in XXXXXX County”. How is that? I sent in a declaratory judgement for the judge to signe accepting the demurrer if honored would make any private man who swore he was “without the United States” and did not take up housekeeping at any address with associated with a zip code and the Courthouse would have NO JURISDICTION OVER THEM UPON THAT SWORN CLAIM… ha ha ha … Of course he refused to sign the declaratory judgement and threatened me with contempt of court. I opened a bank account with a “KINGDOM” I.D., I thought that was pretty cool. That website doesn’t work anymore, apparently. Hansen response > Bummer, I’ll try and contact them. They are friends of mine.